That's good news. That means I am only 1/2 inch off on frame three. I was trying to adjust the two frames proportionally. I think my stem is off. I cut the stem according to the pattern and attached the breasthook and bolted up the keel. I see that I am about an inch off at the rear of the boat (it was hanging 1" above where it should be on the transum). That translates to the stem being 1/4" off at the rear attachment point of the keel, stem, and the first frame. I can bend the keel down and attach it to frame 1 and the transom, but that would leave the bottom of the boat potentially not flat. If I understand how planing hulls work, this would cause the boat to potentially porpoise at speed. I think I have 2 viable options. Add epoxy to the joint of the keel and stem and fill in the gap to where it will sit flat on the keel and then bolt it fast after it dries or remake the keel and breasthook after making some slight dimensional modifications to level it to the keel and maybe add back in the 1" of length that mysteriously disappeared according to the assembly prints. The rest of the boat from the stem back seems to be flat true and straight. Right now I am leaning towards the second option. Any thoughts? On most of the outboard designs the keel curves up to meet the stem - in other words it is horizontal from the transom a certain way forward but then curves up (or down, with the boat upside down) to meet the stem ahead of the previous frame. So if you've bolted the keel up to the stem first it will need pulling down to the transom - it's normal. The Utility has few frames but I'd guess (others who've built this design will be able to confirm) you're looking for the keel to be horizontal from the transom to frame 1, then curve slightly between frame 1 and 2 (where the stem attaches) to meet the stem. Don't get hung up on your 'missing' inch, by the way. Remember you have to skin the boat and that will add slightly to the length (adding material ahead of the stem). If you have calculated that the forward end of the keel is only 1/4” off... that wouldn’t translate to much of a bend. I would suggest carefully doublechecking all the vertical measurements shown in the plans for the construction form. With the keel pushed down into the transom notch, is the keel straight from the transom forward to frame 2? As I recall, the keel (as measured with the boat upside-down) is at a 1 degree upward angle from the transom forward. Can you upload some pictures? The first picture is with the keel bolted down flat on the stem. If you look at the very top of the picture you can see the keel is floating above the center frame and transom. The second picture is with the keel laying in the proper position on the frames and loose from the stem. Remember, most of these boats curve up (or down when upside down) from where the stem joins the last frame. It makes sense that the keel will have a little bend at that point. If that was the case it could also explain your missing boat length. Have you checked the vertical height of the breasthook/stem support block below the setup members? If that distance was too great it would give the result shown in your second photo as well as shortening the boat slightly. In my case I had the stem support block 2" too high (closer to the setup level), but yours could be too low. I have the breasthook on 2 stacked up 2X8's so if anything I am 1/2 too high. It's not the height above the floor that's critical, but the difference in height between the top surface of the stem support block and the top surface of the two long setup members that your frames are sitting on. That distance should be shown on your plans - it is for the Zip. sproggy wrote: It's not the height above the floor that's critical, but the difference in height between the top surface of the stem support block and the top surface of the two long setup members that your frames are sitting on. That distance should be shown on your plans - it is for the Zip. Sproggy is absolutely right. You should double-check all these measurements before you move forward. What I would probably do would be to attach the keel to all the frames and then force the bend into position on the stem via the carriage bolts. Here's another thought. 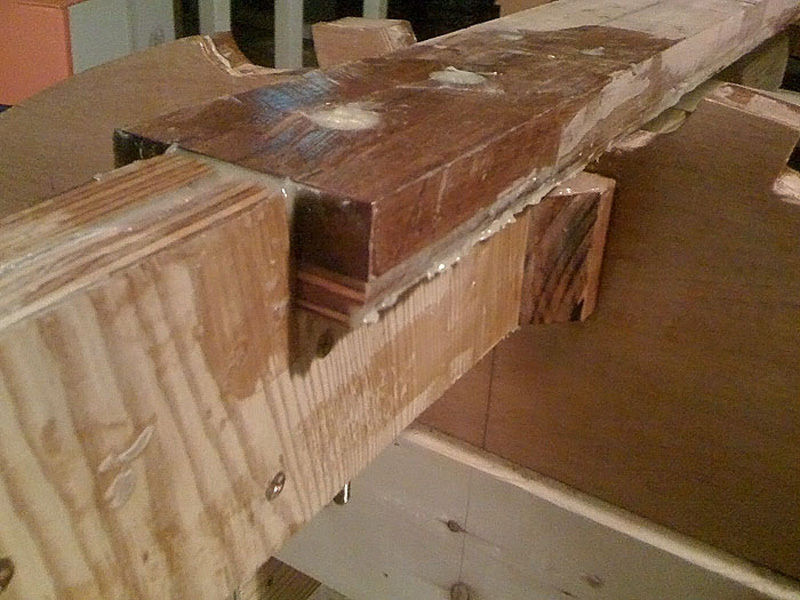 Check how your keel is laying into the frame notches. Is it making full contact? Or, is it contacting the aft edge of the notch and rising above the forward edge? If THAT is the case, you could bevel the notches to lower the aft edge so that the keel makes full contact. The keel would probably drop right into place in the stem. Come to think of it, I kind of remember having to do this. I am still fitting the batons into the transom support and dry fitting all the parts so I can go a bit further since everything is correct in the rear. I am thinking it is important to have the rear of the boat flat and straight, so bending the keel to fit may cause issues later. If I shave rear of the stem and the first frame on about 1/4" slope down to 0" at the front of the stem/keel attachment point everything else should fit perfectly. Before I do that I will double check the breasthook position. I will need to do some business with at laser level to get a a measurement. I do appreciate the advise. It also helps for me to type of what the issues are so I can get a clearer picture in head of what real problem is. I don't know the lines/plans for this design, so I won't be all that helpful, but... We're all assuming the keel board is perfectly flat and straight stem to stern but it looks like there's a bit of upward curvature as it sits on the frames. That could make it appear to not fit properly. I can tell you there are many of the Glen L designs that have some curvature of the keel board from the stem back to the next frame aft. The best approach now is to verify the frames and stem are aligned properly to the set up level which is usually the top edge of the building fixture. You should verify the tip of the stem is at the correct height as measured from the set up level. Look at the plans, there should be a dimension from the set up level to the top surface of the tip of the stem or the breasthook. Double check that you have that distance set correctly, if the tip of the stem is too close to the floor it can cause the keel to stem gap you're seeing. You can run a string from the set up level on the building fixture and extend it forward, then measure from the string down to the tip of the stem. Now is the time to make a correction before you install the chines or sheers. Good luck, let us know what you find, post lots of photos and most of all have fun! Take a straight edge to the drawing. Put it on the keel at the stern. I'll bet it's straight back there and curves coming forward. I took a ruler to the drawings and the keel it dead flat from the transom to the stem. After I checked this, I put a laser level on the bottom of the assembly frame and I found out I am 1" too low on the breasthook instead of 1/2 too high much to my surprise. The garage floor seems to have a slope that increases significantly as you approach the door. Once I put a 1" shim under the breasthook, the gap closed between the stem and keel.